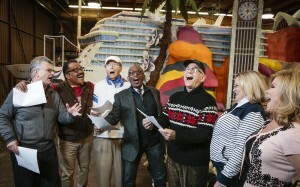 The original cast of “The Love Boat” gathered to decorate Princess Cruises’ Rose Parade float today, as well as participate in a myriad of national and local media interviews which celebrated the reunion of this beloved cast. Princess Cruises, one of the most famous names in cruise vacations, is widely known for its starring role in one of television’s most iconic shows, “The Love Boat.” Their float in the Rose Parade launches Princess’ 50th anniversary year and pays tribute to the light-hearted TV show which played such an integral role in the cruise line’s early history. The original cast of “The Love Boat” will ride on the float, which comes on the heels of this ensemble christening Princess’ newest cruise ship Regal Princess to kick off the company’s golden anniversary year. Named “50 Years of Inspiring Travel,” the float depicts Regal Princess symbolically sailing through the world’s most fascinating cruise destinations and iconic landmarks that guests have experienced with Princess over the past 50 years. Viewers will recognize the Sydney Opera House, the leaning tower of Pisa, the Eiffel Tower, Big Ben, a traditional Japanese pagoda, the Golden Gate Bridge and the tropical flowers and water falls of the Caribbean, Hawaii and Mexico, as well as the majestic mountains and wildlife as featured on Alaska cruises – just some of the sights travelers will see when sailing with Princess, whose ships visit 350 destinations around the globe. The float is 60 feet long and 24 feet high with more than 24,000 flowers and natural materials. Flowers include roses, orchids and carnations, dendrobs, tulips, cymbidiums, delphiniums, and gerbera daisies. Regal Princess will be covered in large white navy beans, white mums and button mums. The water will be accented by dark blue and white iris. Potatoes, green grapes and seaweed will also be used on parts of the float. Additional information about Princess Cruises is available through a professional travel agent, by calling 1-800-PRINCESS (1-800-774-6237), or by visiting the company’s website at http://www.princess.com.